As we are approaching more cold and rainy days, it has become time to use all picked apples to make juice and cider. Last year I tried to make cider with a blend of our own apples and the apples of a friend, as the apple harvest was quite poorly. However, as I let in too much oxygen with racking off, the cider became more of a vinegar. We had to pour it away. So now I want to try again, as the harvest is looking very promising. Luckily, I have a good friend and colleague that has very good equipment to smash the apples and to press the juice of it. A perfect job for a Sunday :-). All in all, our harvest was around 100 kg, not too bad at all! 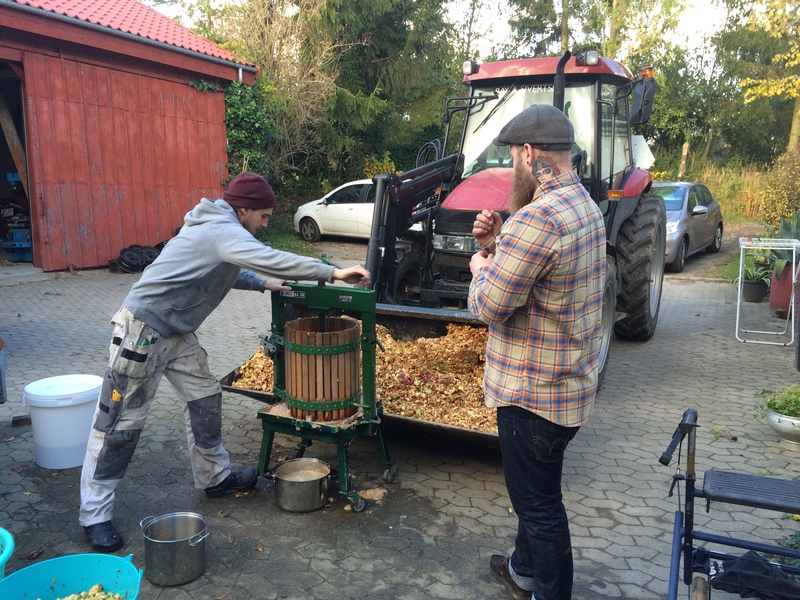 The first step of cider making is to grind the apples into smaller pieces. You can do this by hand with a manual mill, but my friends did it with an electrical fruit mill. And yes, that went fast :-). 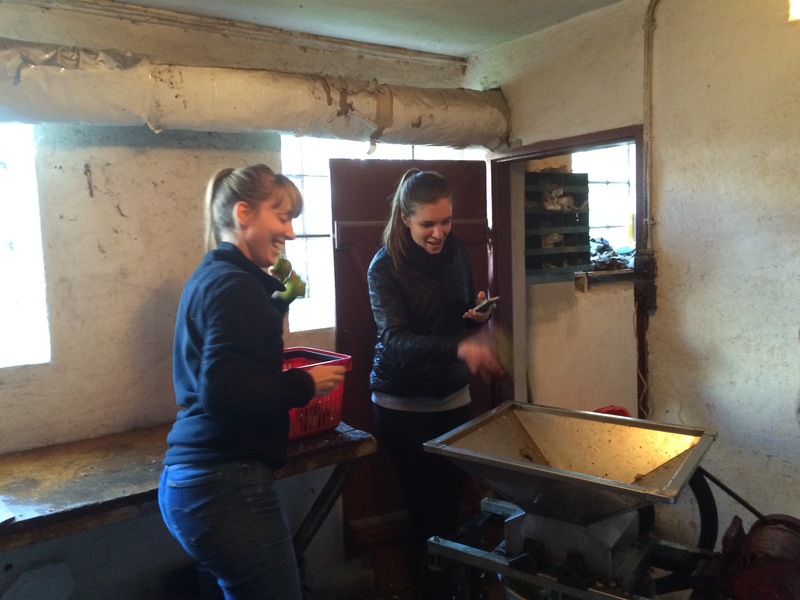 After milling all the apples into small pieces, the pieces need to pressed into juice. As it is hard work, I was glad there were some guys around to help out with the pressing. The leftovers are for the cows, nice dessert for them, as quite some sugar is left :-). And so the first part is ready, apple juice. The juice was way more sweet than I expected, which was super nice. I picked some of the apples when they were still green, but the juice was not acid at all. In fact, the juice had a perfect sweet/acid balance. Then came the time to drive home with my freshly pressed apple juice and decide what to do with it. As it is tasting really delicious, I decided to sterilize 24 liter of the juice, just to drink as juice and to make cider of around 10-12 liter of the juice. Sterilization of apple juice is really important if you want to keep the juice at room temperature. However, sterilization is not difficult at all. You heat up a big pot of water to 66 degrees Celsius (or a bit more to end up with 66 degrees with the bottles in), you put in the bottles with apple juice and you keep the temperature at 66 degrees Celsius for 1 hour. So that is exactly what I am doing here on the picture, in my almost closed home brewery (yes, we are getting there with our building, only one more wall missing!). It is great to have good home brewing equipment, as I can use some of the pots for other purposes as well. 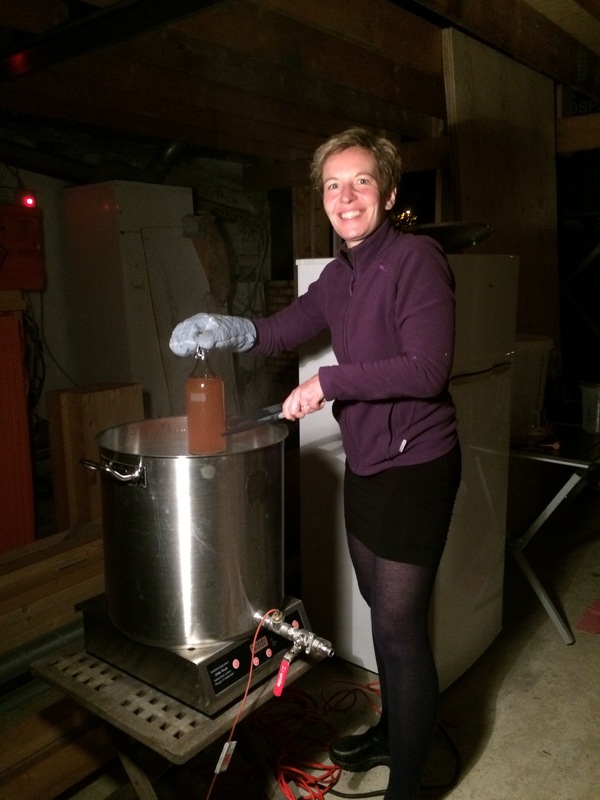 Now the last part, making cider! I decided to use a Chr Hansen yeast, namely Prelude, which is a specialty yeast (it is not a normal Saccharomyces wine yeast, but a so-called non-Saccharomyces yeast – it is called Torulaspora delbrueckii). This yeast will definitely finish the fermentation, as the expected alcohol content is 6.5 – 7%. Prelude is mainly sold as a wine yeast, where you have to add an additional Saccharomyces yeast to finish the fermentation. My guess is that it will need around 2-3 weeks before it is attenuated. Then I will bottle it to referment in the bottle. With some luck, it might be ready for New Year, to have some sparkling cider as aperitif, instead of Champagne :-). Hi, it looked interesting with your cider-projekt. I am also making cider, but have used the traditionel yeast Sacch. Ceriveciae I got from Wyeast (4184). But I have heard Torulaspora Delbrueckii should be a fine alternativ. And then I searching and find your site. What is your experience? I me3an the traditionel Sachh. Cer. make the cider too dry, and if add some sugar it continue to ferment and just stop at 12% It is to much alcohol. Is it right that Torulaspora Delbr. 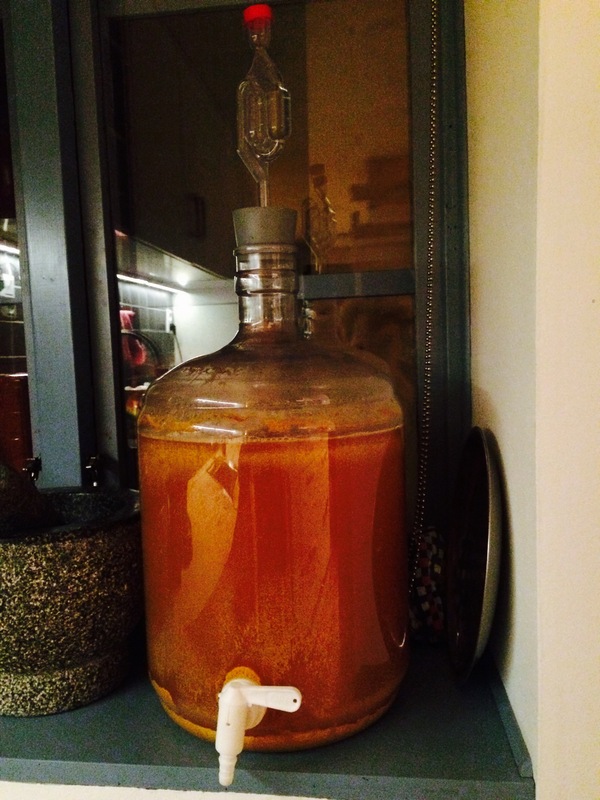 attenuate and stop fermenting at 6%?